What happens when two photography-loving ladies land in Greece in the middle of summer? We take too many photos and get burned. 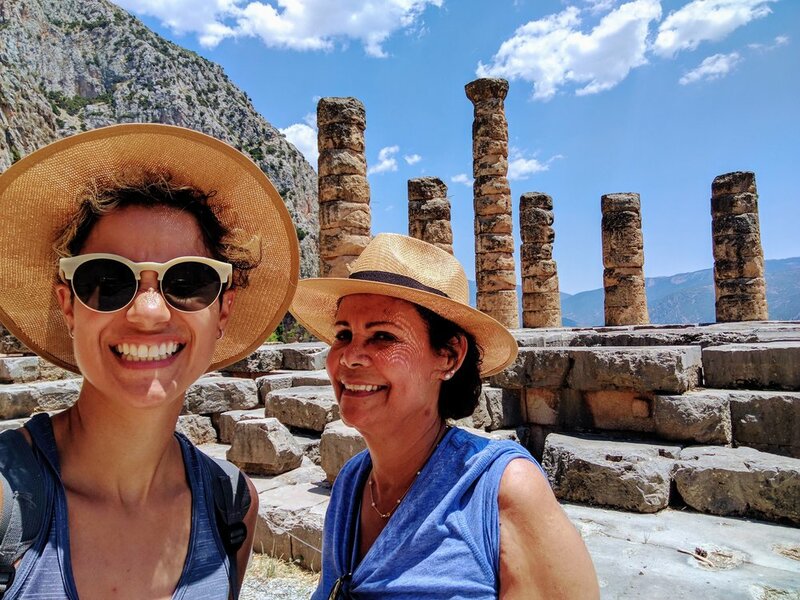 My mom joined me for 9 days in the sweltering heat of the Grecian sun. 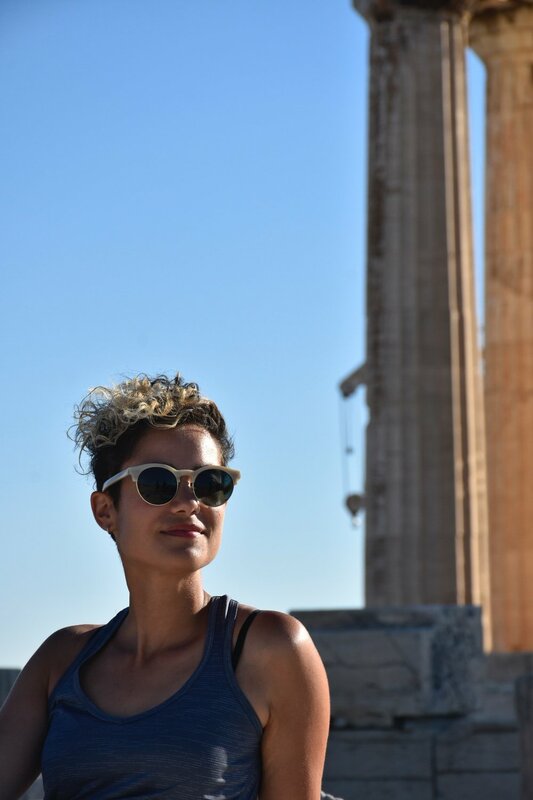 Our luxuriously long itinerary involved a few days in Athens, a few days in Crete, and a day at Delphi. We took in history, we lapped up culture, we soaked up the sun. But, here’s the thing I didn’t realize about Greece in June. It’s hot. I mean, really hot. I mean, hotter than Hades hot. With temperatures soaring in the 40°s C / 100°s F, I was not the most pleasant of travel companions. But, we still managed to sneak in a few good photos and a few great adventures. 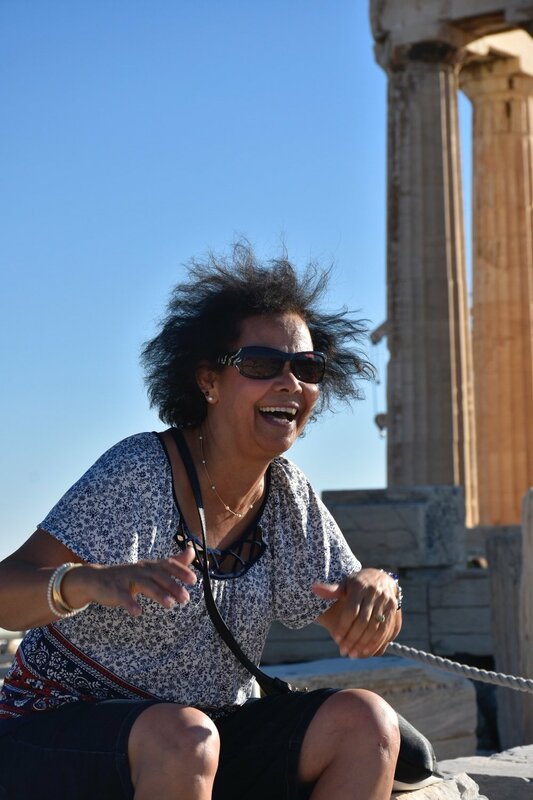 Mostly, I loved exploring the history of Athens with my mom. We're not history junkies but we do love a good story. Lucky Athens is full of stories. It's literally got thousands of years of stories. I'll regale you with a few of those in the guide to Greece post. 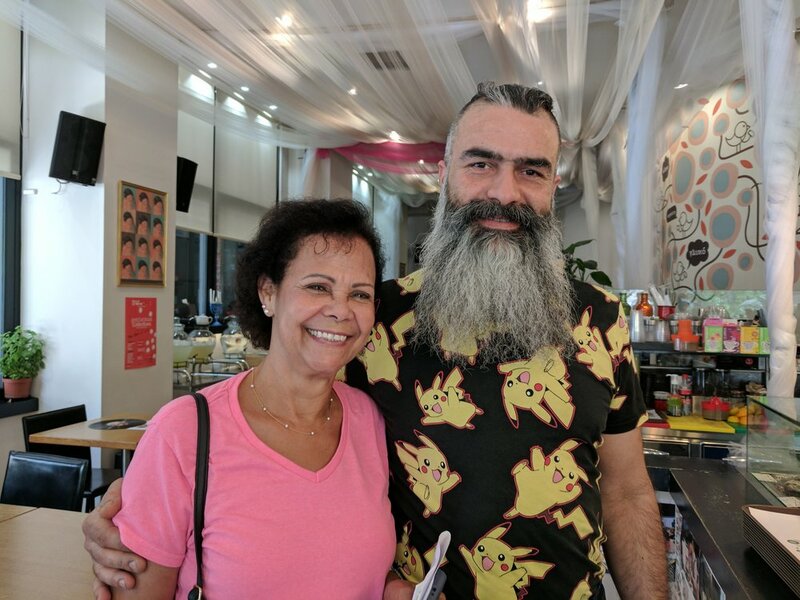 Now, what I didn't realize was, traveling with your mom means you realize just how many of your traits you share. Not just looks. I mean behaviors. And not just mannerisms, I mean, the weird annoying things you do that people tell you to stop. Like, "you're always on your phone!" Guess who was always on her phone looking up some artifact or taking a photo? Mom. And you know how I have a penchant for picking up stray cats, both of the feline and humanoid variety? That's a Juanita special. 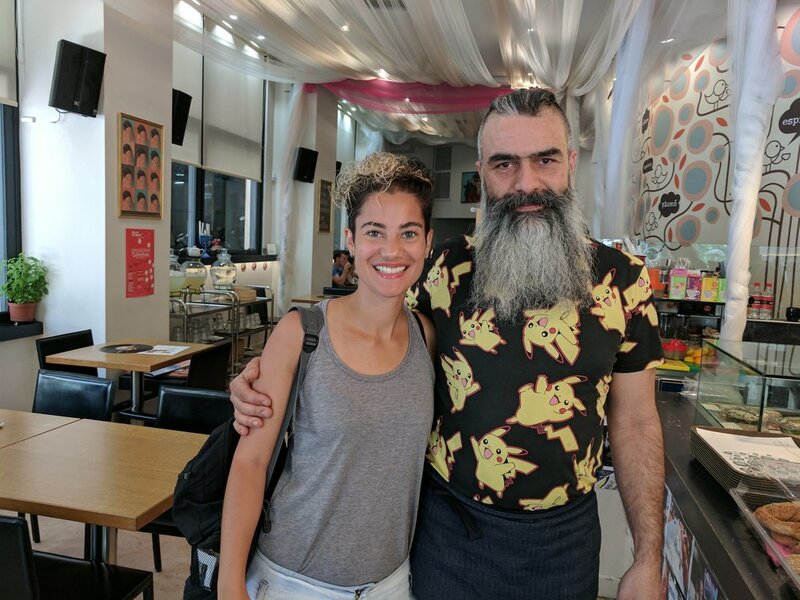 Case in point: Nicolas from Two Sips and Two Bites (that's the English name; in Greek it's ΔΥΟ ΓΟΥΛΙΕΣ & ΔΥΟ ΜΠΟΥΚΙΕΣ). However, please note that she was able to get him to smile. Me? Not so much. And who gives me my beautiful tan skin and unruly hair? My mom. For the record, she hates this photo but I think it's hysterical so it's going on the internet. Morning: A historical site, perhaps the Parthenon at the Acropolis. Afternoon: Enjoy a little reprieve with lunch and drinks! Early evening: Find another historical site, and get a little lost. Perhaps at the Temple of Poseidon. Sunset to Dusk: Stop to take a million photos of the setting sun and liminal sky. Night: Enjoy an evening stroll and food, perhaps at the Athenian Rivieria. Oracle of Delphi, to hell with thee! My mom did not want to rent a car in our travels, so getting out of Athens was a little tricky. Upside? There are numerous tours from Athens so we traveled to Delphi to have a world with the Pythia, the Oracle. Unfortunately she closed shop like 1600 years ago with Roman emperor Theodosius destroyed the temple. Jerk. Our trip to Delphi involved a rather chatty tour guide, named George, who had an opinion or story about everything. He seriously never stopped talking. On the one hand I enjoyed the facts and his Grecian pride, but on the other hand... silence is golden, man! 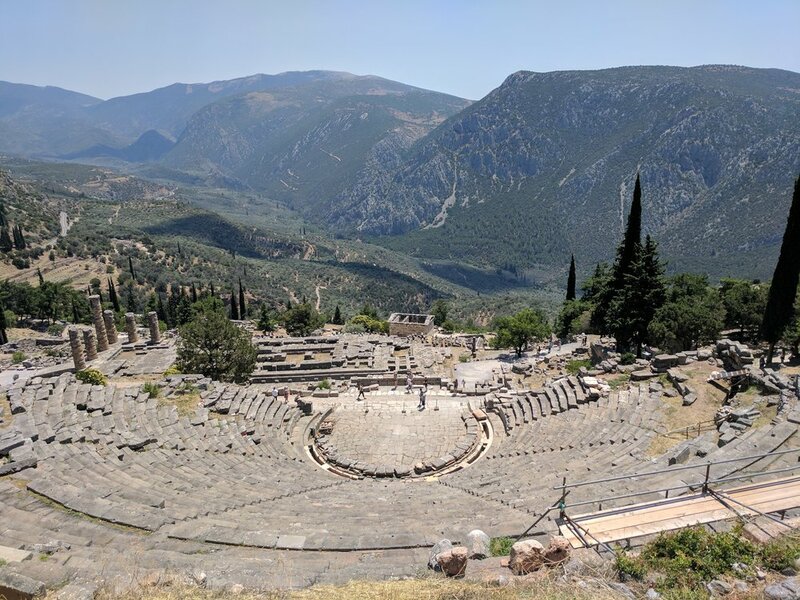 Delphi sits higher than Athens, nestled into the mountains surrounded by cypress trees, lakes, and clouds. It's absolutely stunning and worth a visit. However, I'd rent a car and drive through the small towns and countryside if I were you. I’ll be honest. I was skeptical about this island. Sure the Minoan history sounded intriguing, and the beaches look otherworldly, but, it’s so big! Especially compared to my new favorite, slightly overlooked Cycladic island of Naxos. Add in that mom refused to rent a car and it felt like we were heading to, I dunno, the jersey shore without a car, which seemed problematic. But, I was so wrong! In fact I think some of my favorite photos from our trip I took in Crete. Here's just a taste, but check out the gallery below for more. Luckily a friend had recommended Elafonisi beach and the gorges so I positioned us between both at Chania, which had its own little beaches (fine, but not great), an adorable downtown, and easy bus access to the rest of Crete. If you don’t know, Chania literally just means Port, so you will find many a Chania across the Greek Islands. I was pleasantly surprised Chania! It's quaint, gorgeous, and actually pretty "normal" too. Plus we looked great in its golden light. And with that, and the heat, Fowlers, out.